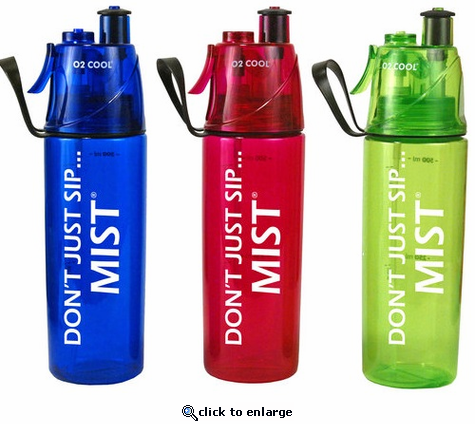 The O2 Cool patented Mist \xEFN Sip\xBB Hydration Bottle provides a unique combination of cooling and misting for unbelievable comfort and convenience. This is is the only product that allows you to keep cool both inside and out. Great for bike riding, sporting events and staying cool when gardening. O2 COOL\xAC is the premier designer, producer and marketer of \xF1cool\xEE, creative, fun and affordable personal consumer products. We are the world\xCDs leading manufacturer of battery operated misting and portable fans, water-cooling hydration products, outdoor accessories and novelty items. Our products have one-of-a-kind features and cutting edge designs, thanks to our team of product designers and engineers who continuously work on bringing new products to life.